blog.HalloweenAdventure.com | Latest News from the Costumes Trend FrontLines! : The Best Santa Costumes We've Got! The Best Santa Costumes We've Got! Christmas is just around the corner, so we've gone through and rigorously evaluated all the Santa costumes we have in stock. Here, we've handpicked the best of the best for you. Go for the gold with our Ultimate Santa Christmas Costume. 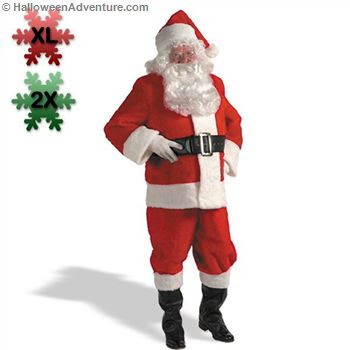 Our Deluxe Luxury Santa suit is so close to the real thing it's scary. It's made to endure even the longest of sleigh rides (you know, like the one where you have to bring presents all over the world in one night! ), and to hold up when you have to climb up the mountain and down again and in the chimney and out again. It's perfect for those who just love when Christmas comes around, and makes a great gift for lovers of Saint Nick. If the Ultimate Santa is just a bit too over the top for you, try our Imperial Santa Suit. This outfit looks just like you’d expect the real Santa’s outfit to look. In fact, the only difference between you and Saint Nick is that he has 364 other ones hanging in his closet and you’ve just got the one. But don’t feel bad. Yours will do! Our Kris Kringle Suit helps you reunite with your long last Sant-y Claus ancestors. This one isn’t just for regular old JCPenney Santas. This baby is for those who know they’re a direct descendant of Saint Nick himself. It’s for those who know to pick quality over quantity. With deluxe plush pile fabric and a whole lot of faux fur, this is a suit that’s sure to stand out. Ex-football players and other men with a little extra lovin’ on their handles should snag our Kris Kringle Costume in Plus Size. Who said skinny guys with no muscle get all the fun? Santa’s supposed to have a little extra somethin’ on his bones! You’re the real thing, and you’re going to look it in our Kris Kringle suit. We promise! For more Santa costumes, as well as so many other holiday options it’ll make your head spin, check out Halloween Adventure’s online store.